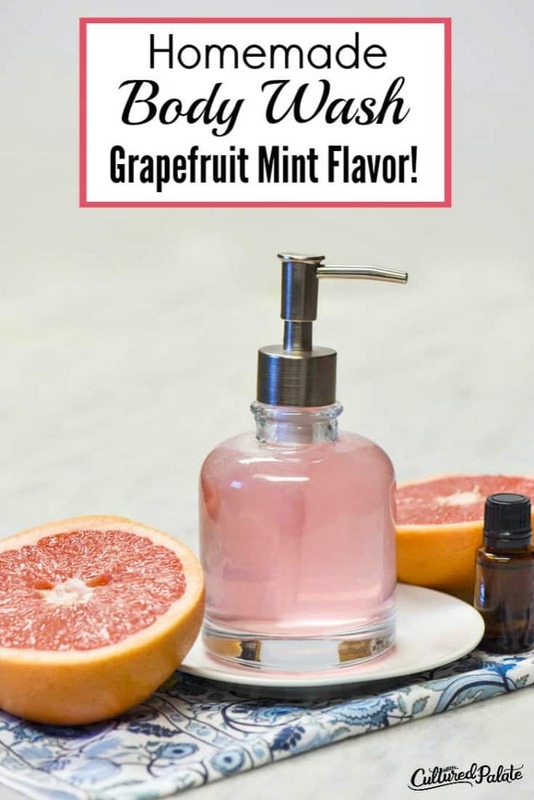 Nothing is as refreshing or invigorating as a tasty body wash. Now you can have that spa feel with this Homemade Body Wash in Grapefruit Mint flavor! I know, you don’t normally think of the word “tasty” in connection with beauty products but one smell will convince you. This is a tasty treat! Not only is this homemade body wash super easy, it is also great for your skin. It leaves it silky smooth without drying. As you look at the ingredient list, you will notice witch hazel. Did you know that witch hazel is good for tightening the skin and can help with itching? It is a natural astringent with anti-microbial properties. If you prefer, you can use the alcohol free witch hazel or use the regular witch hazel. You can check out what Wikipedia has to say about witch hazel here. reduce under-eye bags – many say to use hemorrhoid cream under your eyes but one ingredient of Preparation H which helps it work so well is witch hazel which helps tighten the skin! According to Wikipedia, Castile soap was originally made with laurel oil and olive oil. When laurel oil became unavailable, it was made with olive oil. Now, other vegetable oils are added as with the liquid oil from Dr Bronner which uses coconut oil. Almonds are a rich source of oil, with 50% of kernel dry mass as fat (whole almond nutrition table). In relation to total dry mass of the kernel, almond oil contains 32% monounsaturated oleic acid (an omega-9 fatty acid), 13% linoleic acid (a polyunsaturatedomega-6essential fatty acid), and 10% saturated fatty acid. Linolenic acid, a polyunsaturated omega-3 fat, is not present. Almond oil is a rich source of vitamin E, providing 261% of the Daily Value per 100 ml. What is I am sensitive to witch hazel? You can try the alcohol free witch hazel or simply leave it out. If you leave it out, be sure to increase the water by the equivalent amount or substitute rose water. Is Castile soap drying? I do not find it to be drying. If you are prone to dry skin, start with 2 Tbsp and increase it as you desire. Can other oils be used instead of almond oil? Yes, jojoba oil and olive oil both work well. Is the almond oil necessary? Oil dissolves oil so adding the oil helps the body wash cleanse your skin. At the same time it is nourishing your skin. Can other essential oils be used? Yes. Don’t let this recipe stifle your creativity. Experiment with different combinations and be sure to leave a comment with your favorites! Is the colorant necessary? No. Feel free to leave it out if you prefer but it does make for a pretty container of body wash especially for gifts. Is the colorant safe for my skin? I like to use the India Tree brand which is vegetable colorant that is kosher, and contains no corn syrup or synthetic dyes. In a large bowl or measuring cup, add all of the ingredients and stir well to combine. Place a funnel into your foaming hand soap dispenser and pour the mixture into the dispenser. Leave about an inch of room at the top for residual foam. There should be enough soap to fill 2 (8.5 oz) dispensers. Pump the dispenser 2-3 times to add soap to a wet wash cloth or bath pouf and apply to your skin. 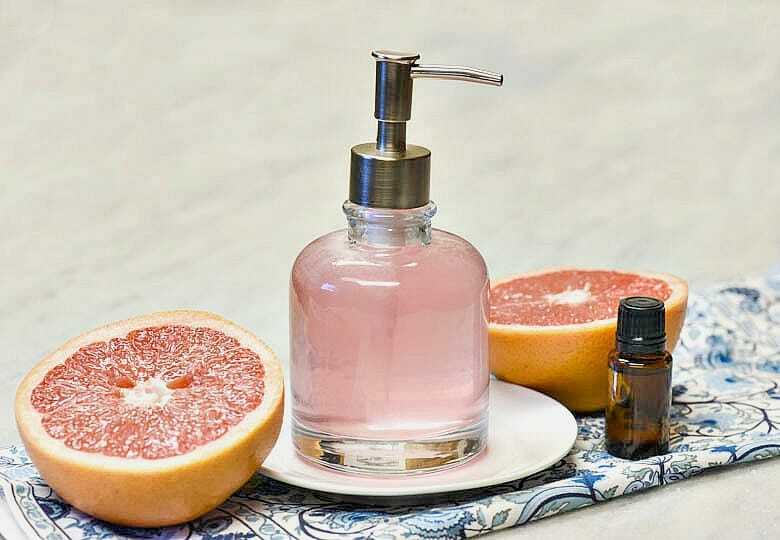 Enjoy the energizing aromas of grapefruit and peppermint as the soap cleanses and moisturizes your skin naturally! Have another great “flavor” combination? Leave a comment and let us know so we can all enjoy it!